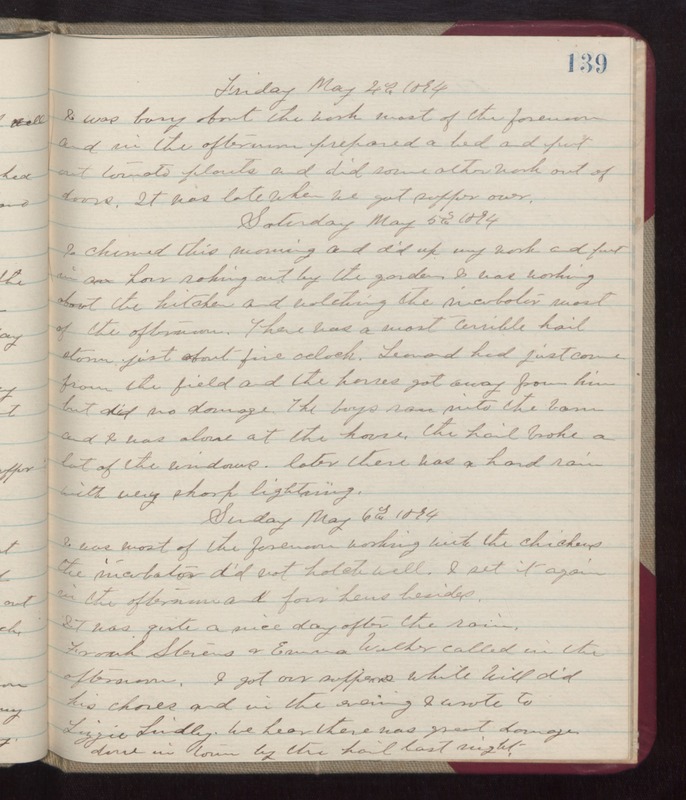 Friday May 4th 1894 I was busy about the work most of the forenoon and in the afternoon prepared a bed and put out tomato plants and did some other work out of doors. It was late when we got supper over. Saturday May 5th 1894 I churned this morning and did up my work and put in an hour raking out by the garden. I was working about the kitchen and watching the incubator most of the afternoon. There was a most terrible hail storm just about five oclock. Leonard had just come from the field and the horses got away from him but did no damage. The boys ran into the barn and I was alone at the house. the hail broke a lot of the windows. Later there was a hard rain with a very sharp lightning. Sunday May 6th 1894 I was most of the forenoon working with the chickens the incubator did not hatch well. I set it again in the afternoon and four hens besides. It was quite a nice day after the rain. Frank Stevens & Emma Welker called in the afternoon. I got our suppers while Will did his chores and in the evening I wrote to Lizzie Lindley. we hear there was great damage done in town by the hail last night.